Unsatisfied with his job at the lab, Englishman Sam Baldwin applies to the JET Program and in 2004 is accepted and sets off for the Japanese countryside. Adventure ensues. 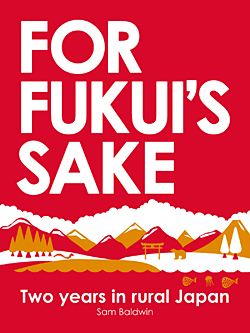 Although I haven't actively sought them out, I find that whenever prompted to read a book about a foreigner's experiences in Japan, I have enjoyed doing so. The most obvious answer to this is my interest in Japan and my ability to relate to a fair amount of the content, but I'm not sure that's the case (or at least the best explanation). I think it is perhaps because the kind of people who write these books tend to be interesting, curious, and adventurous sorts, and when combined with a talent for writing...well, that translates into a good read. In this 208-page e-book, Sam takes us through the highlights of his two years in Japan. He touches upon many aspects of his life abroad, including his relationship with his girlfriend, making friends, adventures both in the wild and in civilization, and his more artistic, spiritual endeavors. I don't want to spoil anything for those who may pick this up, so I'm going to proceed to some elements of the book that I liked and didn't like and then give a little more of a qualified recommendation. When I said that it didn't take me long to get through this, I didn't mean because of its length, but rather because the way in which Sam presents his anecdotes and weaves his stories are engrossing and familiar. This is the kind of writing that I think is perfectly suited to a memoir (or blog) and helps to engage the reader. The book is well-paced, too. Chapters are divided up so that it's easy to read one or two in a sitting and then come back to a new story. A popular JET mantra is "ESID" - "Each situation is different." Reading about Sam's time in Japan really reminded me of that. Of course living in a rural prefecture contributed to how his experience shaped up, but I noted that little of his book was about his actual time at work/school, either teaching in the classroom or interacting with his students (although there is a good story about a sock smeller). I suppose this struck me because high school ALTs, at least in some prefectures, have to go to work even when classes aren't in session, and so a lot of my time was spent at school. It was with a little jealously that I read about Sam's 9-week vacations from work (いいなぁ）. Still, it's interesting to read about people from different stripes of life, with different hobbies and likes/dislikes. Sam is clearly an outdoorsman and an adventure-seeker - two descriptives that I wouldn't apply to myself. Reading about his excursions and fishing trips was kind of like seeing a side of Japan I hadn't during my own time there. I also think he struck a good balance in his reactions to and musing about his encounters in Japan. He admits at one point that he never experienced the downs of culture shock and was pretty upbeat for his whole time in there, and I think most of his stories focus on the positives of his trip. Despite this, he doesn't sugarcoat or downplay his frustrations and the challenges he and his companions face during their journey. If you're reading this, Sam, my heart really went out to you when you couldn't get a spot in the empty lot because of the "Rules are rules and no exceptions" mentality. Man, that is frustrating. Although I did enjoy the book, there were two nits that I wanted to pick. First, despite all the nice things I said about Sam's writing style, I was a little thrown off by his periodic transitions between past and present tense. Some stories were presented in one or the other, and I couldn't really figure out why. Perhaps a minor complaint, but it was something that struck me as I was reading and made me a little uneasy. That could just be the former writing tutor in me talking, though. Second, although I think Sam did a fairly good job in his portrayal of the Japanese people he met (as far as I know anyway), there were times when I felt like he was giving in to popular perception and his style of narration seemed to be highlighting the foreignness of the Japanese from our perspective. I could be off-base in this, but it just felt sometimes as if he were catering to readers who might not know any Japanese people or much about Japan, which I think is unnecessary. In his recollections, most of his Japanese friends/colleagues/acquaintances seem to constantly be referring to him as "Sam-san." ‘Sam san, you like Beatles?’ said the deputy head. Being from England, it was obvious to my colleagues that I must be a huge fan. I suppose this is only more of a feeling than anything solid I can refer to, but I was a little incredulous that he was actually called that so often. Personally, I was usually only called "Paul-san" by people I didn't know very well, or "Paul-sensei" by my students and some colleagues. Once familiarity was achieved, I found that most people simply called me "Paul." But again, ESID. What bothered me slightly more was the way conversations were recalled. Living in a rural town, I am betting a lot of the people he spoke to used Japanese. However even if they did speak in broken English, I find it a little hard to believe that so many conversations (like the one above) could be remembered verbatim. So why give most of the Japanese speakers broken and unnatural English? Well, because they don't speak English, I imagine. Perhaps I'm being a little too harsh and critical, but those were two of my reactions as I read. I guess I'm a nitpicky reader. If you have lived in or visited Japan, or are interested in Japanese life/culture, I'd be willing to bet you would enjoy this book. Likewise if you like travel stories and exotic places you may want to pick it up. In many ways, Sam's book reminded me of Will Ferguson's Hokkaido Highway Blues, a book about a former English teacher's experiences hitchhiking across Japan; a book that I enjoyed quite a bit. If you've read and liked that one, here's another to check out. So there you have it. If this sounds like it might be up your alley, you can visit Sam's website here or have a look at his book on Amazon here.